DeQuervain’s tendonitis or “tenosynovitis”, is a common cause of wrist pain. The condition is named after Dr. Fritz de Quervain, a Swiss physician who described it in the late 1800s. Symptoms arise when there is irritation of the tendons of the thumb within the surrounding sheath at the wrist. Instead of gliding smoothly through the sheath, the abductor pollicis longus (APL) and extensor pollicis brevis (EPB) tendons can be swollen, irritated and painful. Patients report pain in the thumb-side of the wrist. Certain movements of the thumb and wrist can be excruciating. Patients may feel a tender cyst or bump and notice swelling in the wrist. Lifting objects, gripping, or pinching with the thumb often increases symptoms. Occasionally popping of the tendons is noticed by the patient. The cause of DeQuervain’s tendonitis is usually unknown, but symptoms can be brought on by starting a new, repetitive activity. The condition is common in females, especially pregnant women and mothers of young children. It has been called “mommy’s thumb” because of this. Lifting repetitively can be very painful, and it can be challenging to care for the newborn with this condition. How do I know if I have DeQuervain’s? DeQuervain’s can be diagnosed by history and physical exam in the office. An x-ray can sometimes be helpful to rule-out other conditions, such as arthritis or wrist fracture. Finkelstein’s test can help confirm the diagnosis. During this exam test, the patient places their thumb into their palm and wraps/clasps their fingers around the thumb. The patient then moves their wrist in the direction towards their small finger, reproducing their pain (take care, this can be very painful to do!). What are the treatment options for DeQuervain’s? Fortunately, most people improve with time and never need surgery for DeQuervain’s. Therefore, non-operative treatment is tried first for most patients. Treatment is aimed at reducing pain and improving function. Wearing a splint which supports and immobilizes the thumb and wrist (“thumb spica brace”) can help reduce symptoms. Off-the-shelf and custom-made braces are available. Resting the hand by avoiding repetitive thumb motion and forceful gripping may reduce the irritation of the tendons. Anti-inflammatory medications such as Ibuprofen, Naproxen, and Tylenol can reduce pain. Hand therapists can teach stretching exercises and reduce pain with modalities such as iontophoresis treatment. Adjusting the way you use your hand can help as well. Many people can be cured with a cortisone shot or two. Corticosteroid injections are very effective in reducing or eliminating symptoms in approximately 80% of patients. The risks of corticosteroid injection (also called a “cortisone shot”) are pain, infection, skin color change, and rarely atrophy of the skin at the injection site. Diabetics should be aware that blood sugar control can be elevated for a few days afterwards. Also multiple injections should be avoided as they can cause weakening of the soft tissues over time. If these measures fail to improve the symptoms, surgery may be offered after attempting non-operative treatment. DeQuervain’s release surgery is performed to improve the gliding of the tendons with the goal of reducing pain. 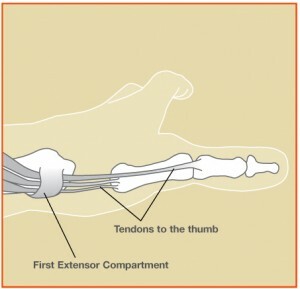 During this procedure, the tight sheath (extensor retinaculum) is opened through a small incision on the thumb-side of the wrist. DeQuervain’s release surgery is performed in Raleigh on an outpatient basis usually under local anesthesia with either oral or IV sedation. After the surgery, patients may use their hands for light activities. Some people can return to light duty work in a few days, but I recommend avoiding forceful use of the hand for approximately 4-6 weeks after surgery. The pain and swelling from surgery gradually subside over a few weeks. Strength and range of motion gradually improve with hand therapy. Most people take about 3 months to feel like the hand is “back to normal” after surgery. Many patients experience good to excellent pain relief and are satisfied with their outcome after surgery. However, not all patients experience complete pain relief. Some patients report temporary numbness at the surgical site or thumb, but this symptom can improve over time. No surgery is risk-free. However, major complications from DeQuervain’s release surgery are uncommon. Possible complications include pain, persistent symptoms, bleeding, infection, stiffness, scar tissue formation, and damage to the tendons or nerves. Rarely, the radial sensory nerve is affected by the surgery, resulting in pain, tenderness, and numbness in the thumb. Image and video are provided by the American Society for Surgery of the Hand.